Featuring interviews with those working at the cutting edge of algorithm research, including Alex Kogan from the Cambridge Analytica story, along with a healthy dose of mathematical self-experiment, Outnumbered will explain how mathematics and statistics work in the real world, and what we should and shouldn't worry about. 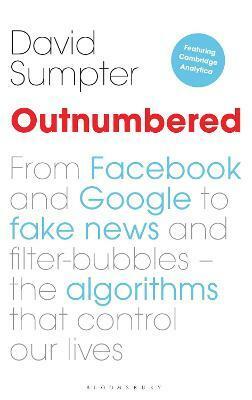 A lot of people feel outnumbered by algorithms - don't be one of them. Chapter 13: Who Reads Fake News? David Sumpter is Professor of Applied Mathematics at the University of Uppsala, Sweden. Originally from London, but growing up in Scotland, he completed his doctorate in Mathematics at Manchester, and held a Royal Society Fellowship at Oxford before heading to Sweden. His scientific research covers everything from the inner workings of fish schools and ant colonies, the analysis the passing networks of football teams, segregation in society to machine learning and artificial intelligence. David has written for The Economist, The Telegraph, Current Biology, Mathematics Today and FourFourTwo magazine, amongst others. He has been awarded the IMA's Catherine Richards prize for communicating mathematics to a wider audience. David's first book was Soccermatics: Mathematical Adventures in the Beautiful Game.